CHICAGO -- The oldest daughter of former Illinois Demorcatic governor Rod Blagojevich called former President Barack Obama "a mediocre president with un-original ideas" in a letter she wrote to the former president regarding her father. 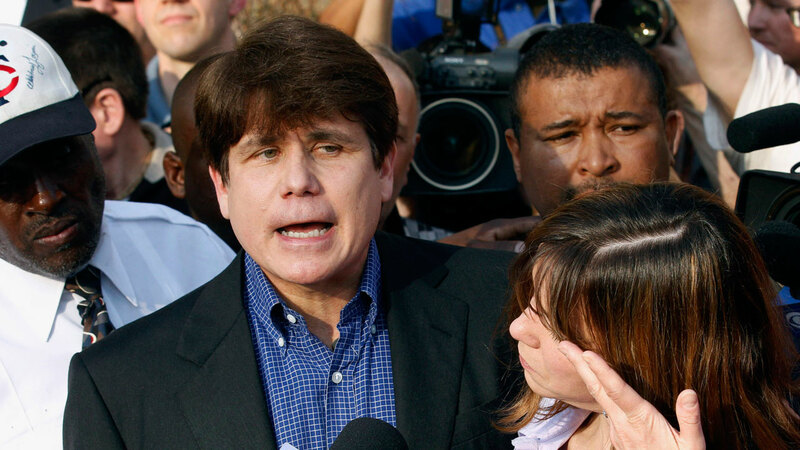 Her mother Patti Blagojevich posted the letter on Facebook Thursday. Amy Blagojevich begins by writing: "Dear Barack Obama: Notice I didn't refer to you as 'Mr. President' this time. That's because you've lost my respect." She expressed frustration that the former president commuted the sentences of Chelsea Manning and FALN member Oscar Lopez Rivera, but not her father. She continued: "You know as well as anyone that my father is guilty of nothing." The former governor was not one of hundreds of inmates who had their sentences commuted in the final days of the Obama presidency. If you didn't notice, I didn't refer to you as "Mr. President" this time. That's because you've lost my respect. You've broken my heart once again, and you've betrayed the concept of justice like many other heartless individuals have done before you. I thought you were different. I thought you had a moral compass. Turns out you're just like the rest - selfish and spineless. You can't deny that you saw the letters my sister and I wrote. I am almost certain that someone put them directly in your hands. That's what they told us they would do, at least. So, you read them. You knew of our heartache and our desperation. Not only that, you knew of the emotional beatings we've taken repeatedly over the last eight years; the kicks in the gut when we were already on the ground, the knives in our backs. You stood by and watched the arrest, the trials, the sentencing, the appellate court decision, the resentencing hearing, and the horrific lies and hurtful words said in the press. You did nothing - said nothing - for eight long years. While my father spent time behind barbed wire, you were living in the lap of luxury. And, as hard as it was, I understood. I blamed you once. In my pre-teen mind, you were what caused the destruction of my life. At one point, though, I moved on. I began to support you. I accepted that you never would've done anything during your first term because it would ruin your chances of getting reelected, and by the second term you had to campaign for Hillary. When the election was done, and you were leaving office, I thought you would finally do it. I couldn't fathom a reason why you wouldn't - your career wasn't at stake anymore. You know as well as anyone, that my father is guilty of nothing. He made mistakes - he's human, after all - but nothing was illegal. I thought you would fix it. I thought you would finally right this wrong. You didn't have to pardon him, only commute the sentence. You just had to let him come home. You didn't. You released others, like Chelsea Manning or FALN terrorists, who actually committed reprehensible crimes, but you failed to release an innocent man. Even if he was guilty of anything, the fourteen year sentence was extreme and you said yourself that you want to make sure that no one is being over sentenced. My father had faith in you. He had, and still has, faith in the system, in justice, in mankind, and in God. I, on the other hand, have lost all faith. I expect people to let me down. I expect the scale of justice to tip in the favor of those who manipulate, lie, and scheme. As for God, I have no reason to believe He exists. If I told this to my dad, it would break his heart. He has become deeply faithful while in prison. He believes that God has a plan for everything and that He is good. I don't buy it anymore. I want more than anything to have faith, but I don't think I know how. If there was a God, an all-powerful, all good, and all knowing God, my family wouldn't have had to endure this trauma. Most importantly, though, my father believes in forgiveness. He harbors no ill will towards anyone involved in his imprisonment. He's not angry. He used to be, it caused him to drink way too much to blunt the pain, but he's not anymore. He's disappointed in you now, but he'll forgive you. He won't hold a grudge. I will, though. I have spent eight years of my life living with such rage and resentment that allowing myself to actually feel it would be debilitating. I am shocked at how bitter and full of hate I have become. Underneath that, though, I'm just sad and hurt. I am sad that I have absolutely no control over such an important part of my life. I have no control over if my dad will be at my college graduation, or be there to walk me down the aisle, or as a shoulder to cry on when life gets even harder - though that seems impossible to me right now. Since I was twelve, I've been wanting my life to go back to normal; to have my dad home and not have to worry about another let down. I'll be 21 this summer, and I'm still waiting. I don't even remember what normal was anymore. I have no recollection of my childhood, and no desire to let myself reminisce in any of the "good times". You could have fixed it. It wouldn't have negated the past - I'm stuck with the scars for the rest of my life - but it would've allowed the cycle of trauma to finally come to an end. I've dealt with depression, anxiety, insomnia, and aspects of PTSD. I've had days where I couldn't pry myself from bed, days where I can't stop crying or feeling the pain that has been inflicted continuously, and days where the fear of another eight years consumes me completely. For a while I couldn't see a news truck without panicking. To this day, I still have trouble with the sound of helicopters. After having them fly over my house for a week when we were trapped inside, hiding from the parasites and their cameras parked on the streets, the sound of one usually makes me feel paralyzed. It's gotten better, though. Most of the time I'm fine. Sometimes I barely notice it until it's flying away. Other times it's all I hear - especially when there's one near my house. Everything is treatable, I've had more than enough therapy to know that, but it doesn't change the fact that I spent my entire adolescence in a state of fight or flight, or that every time there's a chance my last name will be mentioned I'm worried. It doesn't change the inexcusable remarks people have made about my family and I, nor does it the fact that people feel it is their right to say whatever they please to me or behind my back. I've handled it so far, though. I've made it eight years. I'm at a prestigious university and my grades are good. I've kept up appearances. I've visited my dad when necessary no matter how many wounds it reopens. I've been faking being okay for so long, that sometimes it's not an act. Sometimes "out of sight, out of mind is good" enough. Doesn't make up for the guilt I feel for avoiding reading emails from my dad, or talking about him. In high school, I would never say anything about him. Something as trivial as "my dad's a Cubs fan" used to feel taboo to me. I figured that if I pretended I was a normal person, maybe everyone else would forget. I feel guilty that I can't be the daughter he needs right now. He lives for my sister and I, and we repay him by rushing him off the phone and complaining about visiting. But that's how I've survived this long. That's how I've made it through. But I needed you to let him out. I don't know how much longer I can keep it up. I don't think I can make it another eight years. I was counting on you to help. I don't understand why you couldn't put yourself in my father's shoes. You have two daughters and I'm sure you're away from them a lot. Don't you miss them? Don't they miss you? Wouldn't you do anything to spare them the agony of visiting you in prison? Don't you want the best for them? If the answer to any of these is "yes", then you should've commuted the sentence in a heartbeat. Since you didn't, it's my belief that you are either a horrible parent or a horrible person. Either way, like I said before, I've lost my respect for you. Everyone seems to be mourning your exit from office. I'm glad you're gone. I'm not delusional - you're not a saint. You were a mediocre president with unoriginal ideas. Tell me, how did you think of the idea for the Affordable Care Act? Did it have something to do with All Kids? At least All Kids was done correctly, and, unlike the implementation of the Affordable Care Act, it wasn't a failure. I want you to know how disappointed I am. I didn't want to despise you, to have an almost visceral reaction to the mention or image of you. I truly thought you were a good person. I guess I was just as brainwashed as everyone else. At least now I can see the blood on your hands. You can keep washing them, but they'll never be clean. You were a bystander to a completely un-American act of injustice. You're just as guilty as those who created it in the first place.